"Only if science and development turn away from 'morbid technology,' can we hope to sustain harmony between nature and human beings," Indu Tikekar wrote in Santulit Paryavaran aur Jagrit Adhayatma (Balanced Ecology and the Awakened Spirit), one of her last books. This was an abiding concern for this passionate Gandhan social worker, fondly called Indu tai by many. Contemporary environmental crises had their roots in unbridled materialism, she felt and in her lectures highlighted the links between spirituality and ecology. "The present crisis of civilisation is not just ecological or economical, it also has moral and spiritual aspects," she once remarked. A strong critic of consumerism, she wrote at another place, "If the values of the spirit are to take roots, a movement asking to limit our requirements has to be launched." Indu tai is no more. She passed away at a Delhi nursing home. She was 72. A bright scholar with avid interest in philosophy and languages, Indu tai pursued an academic career till the late 1960s, when a meeting with the eminent Gandhian Vinoba Bhave, got her actively involved in the Gram-Daan-Gram-Swaraj (gifting village land and village autonomy) movement and Ziladaan movement in Uttarkashi (then in up). In 1968 tai founded Ujeli-- a Sarvodaya Ashram--on the banks of river Bhagirathi in Uttarkashi. Her close association with Chipko activist Sunderlal Bahuguna and his wife Vimla got tai involved in the anti-alcohol movement, movements for women's welfare and ecological movements like the Chipko and the anti-Tehri dam movement. "She tried to combine science with spirituality and made the Srimad Bhagwat (sayings of Krishna) her medium to raise spiritual and ecological consciousness amongst the mass," says Bahuguna. The Puranas contained 'lessons in ecology', according to tai. "Scriptures of every religion contain ecological truths," she once said. In India her spiritual awakening campaigns began with the setting up of a peace corps at Kasturbagram in Indore. Later through the Mahila Shanti Sena (Women's Peace Troop), she campaigned in many states. 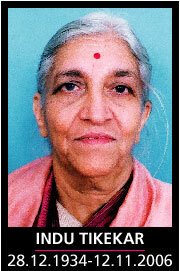 She wrote more than 12 books and many articles in English, Hindi and her mother tongue, Marathi. Tai received the prestigious Right Livelihood Award--often called the alternative Nobel Prize--by the Swedish Parliament in 1987, along with Sunderlal Bahuguna. She carried her message to several countries like Sweden, France, England, Japan and Egypt. "She led a humble life. Money raised from her lectures and campaigns went in educating children and in meeting medical requirements of the needy", says Bina Handa, a close associate at Sannidhi, New Delhi, where she had spent her last days.